Derriere L'Etoile Studios is a printmaking workshop in New York City. Founded in 1978, thanks to the early efforts of publisher Brooke Alexander, the shop worked with a number of exceptional artists. Jennifer Bartlett, Donald Judd, Robert Longo, Claes Oldenburg, and James Rosenquist have produced editions with printer, Maurice Sanchez. Continuing to work on a contract basis with artists from around the world, the studio preserves the tradition of printmaking and supports visual innovation with artists such as Rita Ackermann, Marcel Dzama, Walton Ford, Jeff Koons, Charlene Von Heyl, Josh Smith, and Kara Walker. 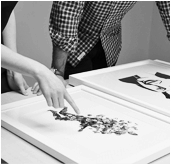 The studio specializes in Lithography and a unique approach to Monoprinting.